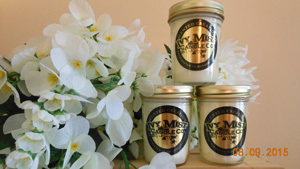 Ivy Mist Candle Company was originated in 1999. We sell decorative jar candles, hand lotions, bath and shower gels, and bath soaps. All of our products are handcrafted in Monroe, Georgia. Soybeans are a renewable and sustainable resource grown by American farmers. Capture the essences of natural soy with candle fragrances that delight the senses. We pride ourselves in our fresh approach to candle fragrance creation, applying aromatic creativity for truly unique and distinctive results. An Ivy Mist candle will burn even, unlike other candles that burn a hole down the center. The scented oils captured in the slow burning soy wax release their fragrance into the air as the candle burns approximately 50 hours for a premium scent experience. The most extraordinary detail about our candle is it has fragrance to the very last hour. Ivy Mist candles have a tremendous amount of aroma and can carry into more than one room. The wicks are made of Zinc - not lead (which is toxic) - and it doesn't billow smoke. Ivy Mist Candle Company also offers fantastic hand lotions and bath and shower gels. Our lotion is non-greasy & fast absorbing, yet leaves your skin feeling unbelievably soft & smooth. Packed with moisturizing natural ingredients such as Coco Butter, Shea Butter, Vitamin E and Botanicals - Great on Face, Hand and Body! Our Bath and Shower Gel is a thick formula, lathers great & leaves skin feeling wonderful (it can be used as a wonderful shaving gel for shaving your legs in the shower). Have a special occasion? Give our unique, colorful gift basket. It contains (1) 8oz lotion, (1) 8oz bath gel with a bath sponge and a (1) 8oz candle. We also include a card so that you can personalize your gift. We offer fundraising and wholesale. If you are interested please contact us and we'll be happy to send you the information. All products handcrafted in Monroe, Georgia.